Philadelphia, PA – January 4, 2018 – Janney Montgomery Scott LLC (“Janney”), a leading full-service wealth management, capital markets, and asset management firm headquartered in Philadelphia, PA, welcomed 38 professionals to its Private Client Group in the fourth quarter of 2017. This includes 21 experienced Financial Advisors, entrusted to manage over $1.95 billion in client assets, two Account Executives, and 12 Private Client Assistants. Janney also opened a new branch in the fourth quarter in Federal Hill, MD. Janney has over $80 billion in assets under advisement as of December, 2017. 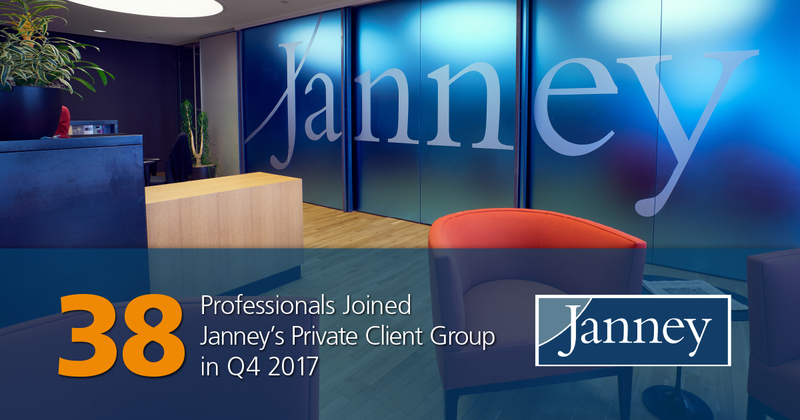 Year to date, Janney has welcomed 140 new Private Client Group members, of which 65 are Financial Advisors.